Never place, or allow a child to place, the shoulder belt under a child’s arm or behind the back because it reduces the protection for the upper part of the body and may increase the risk of injury or death in a crash. Use a belt-positioning booster seat for children who have outgrown or no longer properly fit in a child safety seat (generally children who are less than 4 feet 9 inches (1.45 meters) tall, are greater than age four (4) and less than age twelve (12), and between 40 pounds (18 kilograms) and 80 pounds (36 kilograms) and upward to 100 pounds (45 kilograms) if recommended by your child restraint manufacturer). Many state and provincial laws require that children use approved booster seats until they reach age eight (8), a height of 4 feet 9 inches (1.45 meters) tall, or 80 pounds (36 kilograms). Booster seats should be used until you can answer YES to ALL of these questions when the child is seated without a booster seat. ● Can the child sit all the way back against their vehicle seat with knees bent comfortably at the edge of the seat cushion? ● Can the child sit without slouching? • Does the lap belt rest low across the hips? • Is the shoulder belt centered on the shoulder and chest? • Can the child stay seated like this for the whole trip? 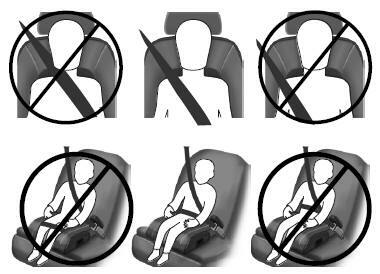 Always use booster seats in conjunction with your vehicle lap and shoulder belt. If your backless booster seat has a removable shield, remove the shield. If a vehicle seating position has a low seat back or no head restraint, a backless booster seat may place your child’s head (as measured at the tops of the ears) above the top of the seat. In this case, move the backless booster to another seating position with a higher seat back or head restraint and lap and shoulder belts, or consider using a high back booster seat. If, with a backless booster seat, you cannot find a seating position that adequately supports your child’s head, a high back booster seat would be a better choice. Children and booster seats vary in size and shape. Choose a booster that keeps the lap belt low and snug across the hips, never up across the stomach, and lets you adjust the shoulder belt to cross the chest and rest snugly near the center of the shoulder. The following drawings compare the ideal fit (center) to a shoulder belt uncomfortably close to the neck and a shoulder belt that could slip off the shoulder. The drawings also show how the lap belt should be low and snug across the child’s hips. If the booster seat slides on the vehicle seat upon which it is being used, placing a rubberized mesh sold as shelf or carpet liner under the booster seat may improve this condition. Do not introduce any item thicker than this under the booster seat. Check with the booster seat manufacturer’s instructions.